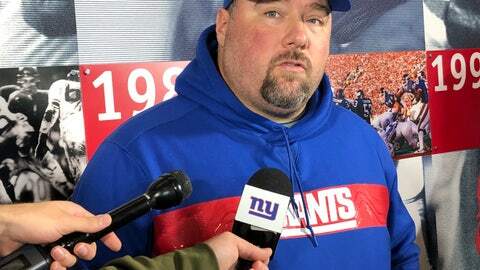 EAST RUTHERFORD, N.J. (AP) — New York Giants defensive coordinator James Bettcher had no intention of designing two game plans, even though Chicago Bears starting quarterback Mitchell Trubisky has a shoulder injury. Bettcher is getting the Giants (3-8) ready to face the Bears’ offense, and it doesn’t matter whether Trubisky is back at the helm Sunday at MetLife Stadium or veteran backup Chase Daniel is running the show again for Chicago (8-3). It’s not terrible news for the NFC North-leading Bears. They extended their winning streak to five games on Thanksgiving with Daniel leading them to a 23-16 win over the Lions in his first start since 2014. “You certainly have some things that you like versus each of those two quarterbacks,” Bettcher said. After missing the first five games with an ankle injury, Giants linebacker/defensive end has recorded one sack in six games. His other statistics aren’t good, either. He has 10 tackles and six quarterback hits. Earning $17 million this season, Vernon was expected to be a dominant pass rusher in the new 3-4 system installed by Bettcher. Nagy has expressed a desire to get Chicago’s ground game going. Maybe this is the week it happens. After all, the Bears will be facing a defense ranked 26th against the run. The Bears have rushed for 64 yards or less in three of the past four games — 38 last week. The Bears have the NFL’s second-best run defense, allowing an average of 80.8 yards. They just haven’t faced a halfback like Giants rookie Saquon Barkley. Playing behind a struggling line, the second pick overall has run for 829 yards. He has run for at least 100 yards the last two games. Add in his 71 catches for 581 yards and he has 1,410 yards from scrimmage, No. 3 in the league. His 12 touchdowns (eight rushing, four receiving) are one shy of franchise rookie record and two short of the team’s single-season mark.